Dietary Supplement of branched chain amino acids (ratio 8:1:1) with vitamins B1 and B6. 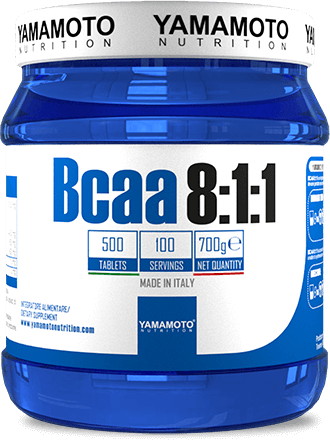 Yamamoto® Nutrition BCAA 8:1:1 is a branched chain amino acid dietary supplement with vitamins B1 and B6. The product has been created using an innovative 8:1:1 ratio (8 parts of L-Leucine, L-Valine, and 1 1 of L-Isoleucine). Branched chain amino acids are recommended to supplement the diet of athletes who train daily. Branched-chain amino acids (BCAA) are an important group of essential amino acids consisting of Leucine, Isoleucine and Valine. BCAA are among the nine essential amino acids for humans, because our body is not able to produce them. The body's only supply is through daily diet or supplementation. Branched chain amino acids (BCAA) account for 35% of the essential amino acids in muscle proteins. Leucine, Isoleucine and Valine are essential amino acids provided by different dietary proteins. BCAAs can be taken as supplements, particularly recommended before intense training or demanding physical work. 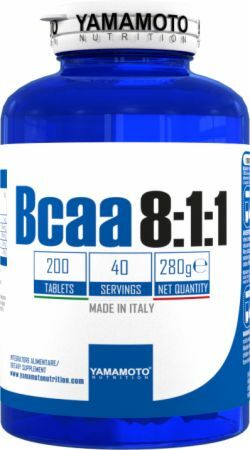 BCAA 8:1:1 contains a 8:1:1 ratio of Leucine, Isoleucine and Valine. No BCAA 8:1:1 Reviews Found. Branched chain amino acids mix (L-Leucine, L-Isoleucine, L-Valine), Stabilizer: microcrystalline cellulose, Anti-caking agents: silicon dioxide, magnesium stearate, pyridoxine hydrochloride (Vit. B6), thiamin hydrochloride (Vit. B1). Directions For BCAA 8:1:1: Take 5 tablets once a day with water or other favourite beverage, 30-40 minutes before training or competitions, or immediately after. On non training days the product may be taken at any time of the day. Warnings: Do not exceed the recommended daily dose. Food supplements should not be used as a substitute of a varied diet. A varied and balanced diet and a healthy lifestyle are important. Keep out of reach of young children. Do not use if pregnant, in children or for prolonged periods without consulting a doctor. Keep in a cool, dry place away from heat sources and sunlight. Close the packaging tightly after use. Branched chain amino acid food supplement with vitamins B1 and B6.